The airports in Delhi and Bengaluru are advancing rapidly but still lag behind sustainability parameters. Retail - ClimateMiles sustainability Maturity Model. Wal-mart is a champion with the practice of sustainability. Miles ahead of the rest. Garment - ClimateMiles sustainability Maturity Model. Garment sector lacks leadership that inspires. 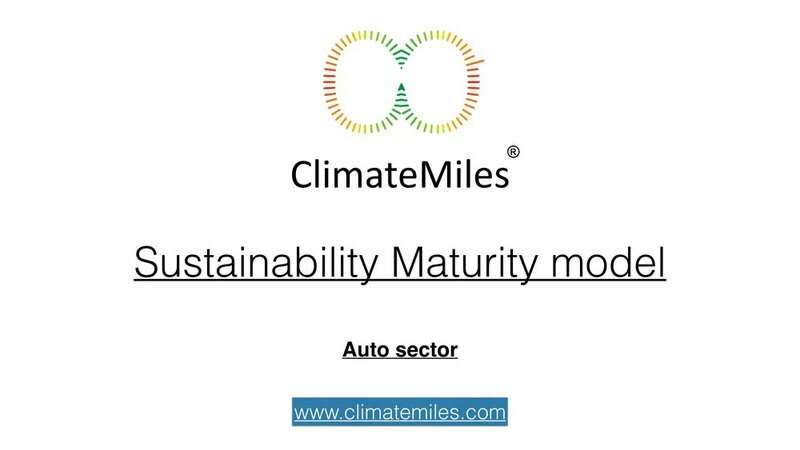 Automobile - ClimateMiles sustainability Maturity Model. We took close to a year to bring this together. The balance sheets were released in various cycles and it took us time to match, validate and analyse them. There are many interesting findings of which the most general is that the Auto sector is struggling to evolve a sustainability strategy in so far as understanding the Life Cycle impact of the materials, Their understanding of supply-chain is limited and hence will be impacted by weather related events. Banking - ClimateMiles sustainability Maturity Model. Is there a correlation between a company’s Sustainability Score and the number of years since its first sustainability report? Chart 7 shows the correlation between Years of Reporting & Total Sustainability Score. Although there is a positive correlation between these two factors, it is not strong (a correlation coefficient of+0.34). As such, no inference is apparent from this data. This model can be used to make a sustainability maturity assessment of practically any company in an industry, map the sectorial sustainability practices and trends, and identify the sustainability leaders and stragglers.